AmericAgent is a superhero working as a special agent for the Paranormal Research and Investigation Mission of the United States (known as PRIMUS). Raised as a sleeper infiltrator for the criminal organization known as VIPER, AmericAgent turned on the international terrorists and, embracing American ideals and iconography, uses his incredible athletic ability and military training to protect America and the world from tyranny, crime, and super-threats foreign and domestic. VIPER has long relied upon infiltrators and traitors to inflict its sinister will upon the governments of the world, but these operatives are always flawed in some way. If they have been turned through corruption, their cupidity can endanger the mission. If they've been turned by blackmail, only the existence of the leverage guarantees their cooperation...and greater leverage can turn them again. And, if they are VIPER loyalists...even the most skilled VIPER infiltrator is through-and-through of VIPER stock, and as such is prey to the failings of VIPER agents: they are sneaky, corrupt, vengeful individualists who, when the chips are down, will always show their true colors. In a word, they are evil. In 1990, a cabal of VIPER sociologists from the Political Division enacted an experiment codenamed 'Project: Dreamwalker'. The goal was to create agents trained to the human limit in all the skills useful to an infiltrator and inundated with images and lessons aimed at producing an archetypal personality, all the while using subliminal and experiential messages to implant an undercurrent of loyalty to VIPER within. They would be raised in isolated enclaves disguised as the local equivalent of a 'small town' and inundated with a complex subliminal message: a strong desire to take responsibility for and guide the affairs of their homeland, a sense that their 'parents' and childhood friends and caretakers were exemplars of virtue and national pride, and a deep and unwavering respect for and attraction to serpents. The subjects for the program were procured from birth, carefully selected from parents both within and without VIPER and had placed in the care of VIPER agents specially trained to portray the role of homemakers and educators. 'Grayson Hurwitz' was one of these subjects at the Cleopatra Falls, Ohio facility, the American Dreamwalker enclave. From an early age, he lived a life oddly parallel to that of many American children: he went to school and church, had a circle of friends, played for sports teams and joined the local scouts. He had what could be called a happy childhood. There were, however, subtle but disturbing differences between his childhood and that of others. There was only one school and church in all of Cleopatra Falls, and he had no upperclassmen...Grayson's class was the first to matriculate. His school curriculum and church gospel were carefully formulated to contain subliminal VIPER loyalty and philosophical messages, while being superficially similar to that of the average American experience. His friends were all 'good kids' like him...but those who didn't, or couldn't, achieve high marks in school and sport left the town, their parents getting 'new jobs' and leaving abruptly in the middle of the night. The town's sports leagues only ever played intramural games, with a culture of cutthroat competition encouraged amongst the players. The 'Scouting Organization' in Cleopatra Falls was intergender, and enrollment was mandatory. While all the usual hallmarks of the Scout experience were there - merit badges, camping trips, sales drives - the courses were decidedly paramilitary, with combat courses and SERE training a vital component from an early age, and regular visits from 'out-of-town' scoutmasters who were, in fact, VIPER Academy trainers sent to instill the highest-quality of infiltration skills in Dreamwalker subjects. Finally, while a 'whitebread' love of America and familiarity with its 'core cultural values' were ingrained in the children constantly, there was an additional message: that America was in danger, that a wave of corrupt and immoral leaders and a dangerous, poorly-contained populace threatened its freedom...that was, it was said, why Cleopatra Falls had so few visitors, and was so isolated from the rest of the country. The message was subtle and pervasive: love America, but fear for it's future. As Grayson began to reach the end of his term at Cleopatra Falls at age 16 (intended to leave two years to gain 'buffer experience' with standard American culture before enrollment in college), an inter-VIPER power struggle changed his destiny forever. The Technical and Financial Division pointed out the tremendous resources and risks allocated to Dreamwalker with nothing concrete to show for it after nearly twenty years, and were granted joint control of the Project by the Supreme Serpent. General Lorelei Tannhauser decided to use some of the 'resources' of Dreamwalker for her personal passion: Project Paragon, an initiative to discover the 'Champion Factor' that, she believes, allows certain individuals to face overwhelming odds and succeed. Seeing the senior-year products of Cleopatra Falls as perfect stock for experiments, they had 'Scoutmasters' from VIPER Academy 'recruit' Grayson and the other four top members of his class for a 'secret government project' meant to create 'special defenders of liberty and justice'. Diverted to a VIPER laboratory in Virginia, the teenagers were placed in isolation tanks and subjected to a hazardous cocktail of chemical, radiological, and gene-therapy treatments intended, in a scattershot way, to try and replicate the effects of Project Perseus. As he floated in the isolation tank, mind and body alight with the transformative processes inflicted on him, he dwelt upon all he had learned and experienced. As his mental processes were refined and perfected by the process, he came to a horrifying realization: he had been lied to. The subliminal, driving sympathy and respect for snakes...the questions answered with fallacious argument from authority...all the classmates who had disappeared under mysterious circumstances...every small imperfection he had ever noticed, consciously or unconsciously, in the media...something was deeply awry. Grayson Hurwitz entered the tank as a sleeper agent for VIPER, but he exited it as a tremendous physical specimen with top-grade tradecraft and near-superhuman mental and physical faculties. When he discovered that his classmates had all succumbed to fatal somatic mutations...he knew he had to get out. Bursting through the VIPER guards, he stole a blaster rifle and an Air-Cycle and escaped the facility, pursued over the Potomac by VIPER Air Cavalry and shot down near Alexandria. Before they could land and finish him off, however, they were driven off by the superhero Victory, who rescued Hurwitz and brought him to Langley Air Force Base, where he was debriefed. VIPER reacted quickly, however. By the time Federal investigators got to the laboratory in Virginia and Cleopatra Falls, they had been evacuated and mostly demolished by cleanup crews. While a massive manhunt broke out, none of the student-subjects at either facility were recovered, and their fates went unknown. Hurwitz himself was an anomaly...even if he HAD any known family, he couldn't be released to them in good conscience, considering his background and abilities. It was decided that, until the age of majority, Hurwitz would be placed in a special group home maintained by DOSPA known as 'the Rookery'; a juvenile housing facility intended to provide care and education for youths affected by the paranormal world. Sidekicks of fallen superheroes and villains...young supers without family to take care of them...they all ended up at the Rookery...part juvenile hall, part boot camp, and part private school. For the first time, Hurwitz was exposed to people who had had 'real' childhoods...not the prefabricated psycho-comedy perpetrated on him by Project Dreamwalker. It was a shock to the system...he went from being an all-American kid, knowing and known by everyone around him, to a near-prisoner despised as a nerd by peers who ranged from quiet introverts to obnoxious emo-punk telepaths. With support from the staff of the Rookery, and check-ins from Victory, however, Grayson was able to overcome this transitional period, and eventually formed a solid group of friends among the other 'inmates'. As he reached the age of majority, Grayson decided that what he truly wanted out of life was the 'real' version of what had been instilled in him by Dreamwalker: to take responsibility for his homeland and exemplify its virtues to the very best of his ability, while opposing the small-minded and retrograde, as well as criminals and ne'er-do-wells everywhere...like the cabal who had created him. He set his sights on joining the Justice Department's anti-supervillain agency, PRIMUS. His background made this highly unlikely, however, and furthermore entrance into one of the country's premier law-enforcement agencies required a college degree and years of work experience. He would need to prove his loyalty beyond the shadow of a doubt. To achieve this goal, he attempted to enlist in the United States Army. An extensive battery of psychological tests were conducted and, with the support of the staff of the Rookery, he was admitted. He furthermore asked to be considered to join the Airborne division and stumped for entrance to the elite 75th Ranger Regiment, leveraging his extensive combat training and near-superhuman capabilities to serve in a rifle company with the 4th Ranger Battalion out of Joint Base San Antonio. As a sergeant, he lead a fire team during operations throughout Iraq and Afghanistan, serving three tours-of-duty and, more than once, finding himself taking part in missions involving super-terrorists. Hurwitz gained a reputation as a sterling soldier, but occasionally chafed with others due to a perceived pomposity and self-exceptionalism. When not in the field, he engaged in ferocious study and training: from the Ranger School and handbook, to the reams of information on operations and protocol, to attaining credits towards a bachelor's degree...he had set his goal and pushed towards it with single-minded determination. It was all nearly for naught, forever, when he cottoned on to a criminal conspiracy between American mercenaries working with the military and Asian black marketeers to steal supplies from the Afghan security forces. Forced to buck the chain-of-command in order to deal with it, Hurwitz found his career jeopardized and his faith in the military's mission shaken. As his active term of service came to a close, he found himself still short of the age limit required for entrance to PRIMUS, as well as hip-deep in earning his forensic psychology baccalaureate at Millennium City University. Spending time with a friend from the Rookery, he experienced his first taste of life outside of the Dreamwalker program, the Rookery, or the military...a nice, peaceful break...that shattered when the Qularr invaded Millennium City. Caught within the Qularr mothership's force-shield while visiting the PRIMUS recruitment center near the Renaissance Center, Grayson donned an American flag bandana over his mouth and pitched in against the invading aliens. Securing a Qularr blaster weapon, he assisted local police and PRIMUS agents in defending the citizens of the city while the Champions duked it out with the Qularr and the Destroid forces which had organized the invasion. Even after the Ironclad Defense, Grayson remained with cleanup crews, desperate to rescue those who may have remained alive in the battle-torn streets and buildings. When word reached the Golden Avenger about the flag-garbed applicant who faced alien troopers fearlessly, moved like a acrobat across rubble-strewn streets, and risked his life and health to rescue and succor people in their time of greatest need, he investigated Grayson's personal files. Despite his checkered and shadowy origins, the Avenger liked what he saw, and gave the word: VIPER or no VIPER, this man was PRIMUS material. More than that...while PRIMUS had occasionally worked with superheroes, and had their own corps of superhuman agents, they had no superheroes working directly for them...despite the ASPRA protocols that allowed registered superheroes to arrest and testify against criminals. It was believed that Grayson Hurwitz might be the perfect candidate to serve as both cape AND Fed. After a training course at PRIMUS' Camp York, and two years of service as a Special Agent, they had no doubts. 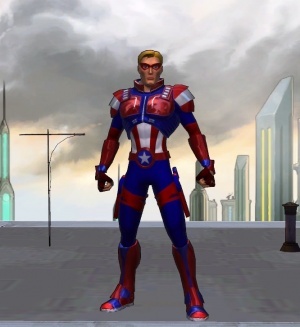 Now, as AmericAgent, Grayson Hurwitz takes the battle against the foes of justice and democracy to the skies...to the streets...to the depths of danger and the heights of glory! AmericAgent has peak human capabilities...treatments similar to the U.S. Government's Project Perseus techniques have made him a physical specimen exceeding even Olympic athletes and sharpened his mental faculties, offering exceptional ingenuity and recall, personal magnetism, and a tendency towards polymathy. In times of intense need, he can run nearly a mile in a minute, and deadlift over 1500 pounds. His standing leap clears 25 feet, and he has an acrobatic ease that allows him to perform seemingly-impossible feats of grace and agility with easily repeatable results. His training in athletics and combat are nearly peerless, and he can use almost any weapon with skill...including his own hands and feet. A graduate and devotee of the Ranger School, as well as an early education in intense paramilitary techniques, have made him skilled in operations in both urban and wilderness settings. His enhanced memory and dedication to improving and honing his skills gives him at least a passing familiarity with a wide variety of subjects, from the technical to the obscure. Omni-Blasters - A pair of customized pulson blaster pistols, AmericAgent's unique Omni-Blasters contain micronized repeating pulson chambers, as well as magazines of a variety of ordnance from the less-lethal to the exotic. Combined, these allow him to deploy tactical choices with voice commands during combat. Sample shot modes include: Ricochet Fire, Penetration Shot, Automatic Fire, Tracer Round, Deep Freeze Round, Laser Blast, Taser Round, High-Explosive Charge, Riot Gas round, 'Glop' (a fast-hardening non-lethal option that traps individuals in a shell of polymerized aramid) Round, Flash-Bang Round, and Cutter Beam. Ascension Gauntlet - AmericAgent's gauntlets contain spools of flexible aramid material doped with threads of ferromagnetic material. With a gesture, they launch towards a target and, after receiving a charge from flat-batteries inside the gauntlets, magnetically adhere and stiffen, providing a high-tensile line for ascension...or, in the case of an agile individual like AmericAgent, swing off of. Due to the requirement of a magnetically resonant structure to adhere to, the Ascension Gauntlet is mostly only of use in cities, where the preponderance of ironwork and the steel cores of buildings provide ample opportunities to swing. Grav-Cycle - A single-person (with room for a passenger or small amount of internal cargo) conveyance, the grav-cycle uses advanced technology based upon UNTIL sky-command devices to offset the gravitic pull of the planet and allow for high-speed flight. Armed with a variety of advanced weapons, AmericAgent's bike is customized to move quick and pack a heavy punch. It also contains storage space for Omni-Blaster reloads, as well as hazard gear, medical supplies, and communications equipment. To Grayson's taste, it's in cherry red. He calls her 'Zandalee'. This page was last modified on 15 May 2016, at 20:57.